I am currently taking trigonometry at school and was asked to find cotangent of 50 degrees for my math homework. However, my calculator did not have a button to do that! I wanted to make a calculator that did have buttons for the other three trig functions, secant, cosecant, and cotangent. 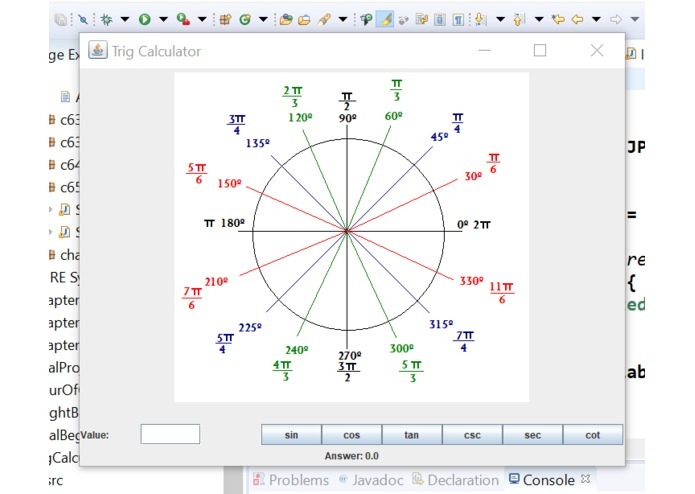 The user inputs an angle measure in radians, then selects which trig function they want the value of. The program returns that value. I built this program using Java in Eclipse. The default Math functions only took in radians, so my program is limited to taking in radians. It is a functional program, although it is not user proof. I learned how to import images into Java! I also learned how to organize all the JPanels. I want to make it work with degrees, and also make buttons around the picture of the unit circle to auto select angle measures.